The 2014 FIFA World Cup Final match plays today at 3:00pm EST, about an hour from now, at the Maracana stadium, in Rio de Janeiro, Brazil, South America, Western and Southern Hemispheres, Earth, our solar system, the Milky Way Galaxy. Here. 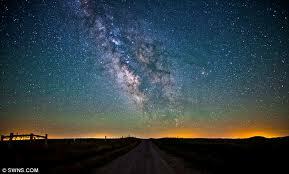 I’m told you can see the Milky Way, and its gradual tilt overnight, somewhere in the corn fields of Iowa, and perhaps in rural regions the world over. This way is a symbol of constant change and perceived constancy, a swirling path we travel within while ourselves rotating on an oscillating axis and revolving around a sun that rises and sets in this galaxy, just as it does on our planet. Another setting, another rising have brought us to this day: A global, month-long sports tournament and exhilarating spectacle, recurring every four years for twenty World Cups, once again climbs to a pinnacle and, with the greater speed of gravity, descends to rest dormant–though beating and breathing–in the imaginations and emotions of the everyday lives of fans young and old, spectators old and new. Yet the intense work scarcely hesitates, restarting the same process, until the next fourth summer in the Northern Hemisphere (winter in the Southern, as it has been in Brazil). We live our lives by cycles, by seasons of all sizes and types, returning to familiar states of being, forever saying “so long” to others. A drilling down into the crust of this earth exposes the layers of cycles of our many pasts, in the bones of our ancestors, and some descendants, and in the strata of the living, pulsing planet. What a rare and wonderful blessing, to feel the security of knowing one’s rightful place in time and space. So few living human beings may luxuriate in such a sense of rightness, and the feeling, like all feelings, is fleeting. How precious these moments in experience. That they may be shared and collectively enjoyed from time to time amplifies the rightness into greatness, expands elation into rapture. Win or lose, we experience the unmistakable richness of high and deep emotion fused into an undeniable, unified energy. Together–across the sectors and lines of city, region, country, continent, ocean, and hemisphere; through the boundaries of language, culture, neighborhood, street, household, stadium, and playing pitch–the unity of a common love of futbol, team, and player penetrates.